Brake Rotors, Pads, Lines, Fluids, and Ducts – Oh My! Rotors have slotted CNC machined into the rotor’s face. Dimpled have, well, dimples – just like a golfball. Pros: This helps with de-gassing that brake pads under hard use and high speeds. A thin layer of gas can form that can interfere with pad contact to the rotor. The idea here is the vein/slot/dimple will give an exit for the gas to escape/go. Cons: If you ever have pad material transfer (warping) on the rotor face you will not be able to mill the rotor surface (take off a thin amount of material to clear up pad transfer)*. Creates fissure points for the rotor to crack from. De-gassing is not often heard of anymore. And doing 200 mph to zero runs — not common. *True for about 95% of the world. Some higher end shops (race shops) will be able to mill slotted rotors. Check area for availably. Recommendations: street use, autocross use, track use**. **Note: pad transfer can occur, not turning means wobbly braking. Use at your own discretion. Two variations – holes are a part of the rotors mold and holes where drilled into the rotor after it was molded. Typically, the molded with holes is more expensive, but it is better than having the rotors drilled after molding. Pros: Supposedly helps with rotor cooling. However, today’s, modern rotors, have internal venting vanes in between the rotor faces. Cons: Rotors that are drilled after being molded can be weakened, structurally. Many HPDE event organizers will not allow cars with such rotors on the track. Cons: If you think you are gassing the pads – no where for gasses to go. There are a few variations on the internal vane construction – straight, curved, island. Straight vane are generally the standard. Cheap and non-directional. Curved vanes are directional and must be installed correctly for them to be effective. Island (DBA) is a mixture between straight and curved. Islands are mini-vanes that direct air like a pinball machine. Stay away from low end rotors. Metal used is less pure and typically not as durable. Another option is cryogenic treatment. Similar to forging steel. Cryogenic treatments (PowerSlot) adjust the internal molecular structure of the rotor material to relieve the internal residual processing stresses from manufacturing. Result is often a rotor that wears better and longer. Resistant to pad material transfer (“warping”). Brake jitter, which may people commonly call “warping”, is not true warping. 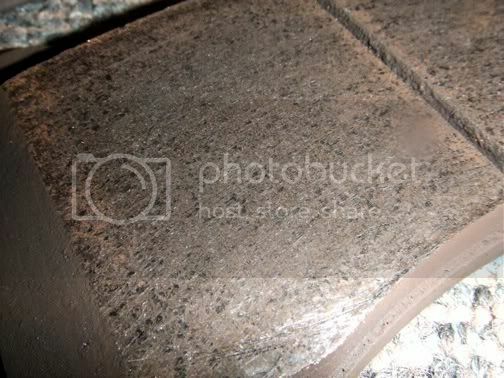 It is pad material transfer from the pad surface to the rotor surface. Creating a high/low environment on the rotor surface. That high/low is the jitter that is transferred back to your brake pedal and steering wheel. Pad material transfer happens when the pad got too hot or pad type used is too far outside of its operating range. When a pad is beyond its maximum operating temperature (MOT) it will start to breakdown. Not only will this significantly decrease the pad material, but it can lead to catastrophic failures (pad separating from backing plate). Inversely, when a pad is used below its operating range (like many race pads), can lay an uneven layer of material film on the rotor. Two sections here – street and track. I am a big proponent to separating the two. Brakes are the line between you on the track and you flying off the track at the end of a straightaway. On the tracks, massive amounts of heat is generated. Street pads are just not designed to handle those levels of heat. 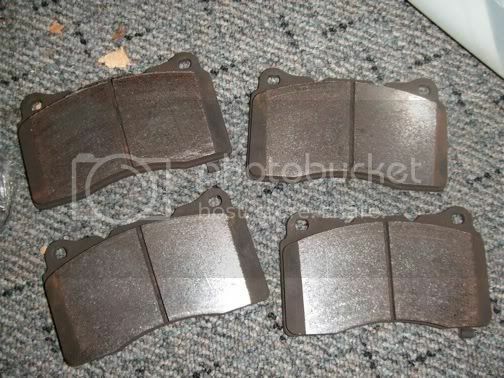 These are pads that are only meant to be run on the track. Again, they should not be taken out on the street. * They take some temperature to work right, without that temperature they might not work or have much stopping bite. *Some pads are now blending those lines. Enough cold bite to work on the street. Might make noise or wear rotors faster. Two levels to track pads – street tires and r-comp/slicked type tires. Generally, stickier tires (r-comps) means you will need more brake due to the increased levels of grip the tires will give you. They can and will overpower your pads. Also, more power equals more speed means the same ruling as r-comps. How much power or weight? On a previous car, 3200 lbs with 340whp, trapped 116-117 in the quarter mile. I was at the edge of street tire type pads (HT10). If you make over 350whp or weigh in at over 3200 lbs – a beefer pad might be wise. Most quality pads have been burnished in the factory. Subjected to a heat cycle and cool down. This molecularly fortifies the pad material for application use. A final bedding once on car will finish the installation process. Another heat cycle and transfer a thin working layer of material to the rotor surface. If installing new rotors with current pads. Bed as below to apply thin working layer of material to the new rotor surface. *With new rotors be sure to clean with soap and water to remove oil on metal. Oil is there to keep them from rusting from factory to you. *Noise: If you do the above and get a squeal or noise. Apply CRC Industries Disc Brake Quiet (orange glue type material) to backing plate where it touches the caliper piston and/or fork. Let dry. Install and drive. Noises come from a few places. One is pad lightly touching the rotor causing a squeal transmitted through the pad into the caliper. These are brake lines that directly replace your original rubber/steel reinforced lines. The benefit here is not immediate, but consistency. In the past, OE rubber lines have been known to expand, leading to a squishy pedal, or worse, crack, leading to death. Most modern cars seem to have decent lines, less cracking events (bad for manufactures). But, hot lap after hot lap, the lines can start to get a heat transferred into them. The SS lines will not expand, this is where the consistency in pedal feel comes from. And now can be had for a reasonable cost. Not all SS lines are created equal. SS lines must be DOT approved. For track or autocross cars, the fluid should be changed/bled much more often. Running the fluids at high temperatures does wear it out over time. This can be seen in its color. Most fluids are a clearish color, after track or heavy autocross use they will go to amber and even black. As a reference, I flush the fluids every spring to 100% fresh. Then bleed before any track days and every couple of autocross events. 12 oz will do a bleeding, 24 oz for a flush, 36 oz for brakes and clutch lines. Power bleeders like the Motive units make it a very easy job. Brake duct cooling kits do exactly what they sound like – they cool the brake rotors with direct cool air. These are very beneficial on the track and even useful in autocross situations. A ducting kit can lower rotor temperatures by 20 to 30%. Porsche 996 GT3 (2001-2005) Brake Duct Spoilers are around $30 new and a great starting point for cooling glides. Ford Racing makes a Boss 302 ducting kit. However, if you are clever a home repair store trip can net you most of the ducting and zip ties to DIY. BBKs do not make the car stop better. BBKs are just better heat sinks. 99.9% of cars with BBKs do not need BBKs. Stopping comes from pad drag coefficient and temperature control comes from pad material and ducts. The Brembo setup on the GT package is very similar to other OEM Brembo brake systems. Benefit is quick change pad access.